Caffeine, a stimulant, occurs naturally in coffee beans and cocoa beans and products made from them. Coffee generally contains more caffeine than chocolate, and even decaffeinated coffee contains small amounts of caffeine. In the United States, food processors do not have to list caffeine content on package labels. Cocoa beans contain caffeine, so the higher the percentage of cocoa in a chocolate bar, the higher its caffeine content. Likewise for coffee: Ounce for ounce, the more diluted the coffee drink, the less caffeine. A 12-ounce latte contains much less caffeine than a 12-ounce mug of plain coffee. Home-brewed coffee often contains less caffeine than coffee shop coffee because chains such as Starbucks use a higher percentage of coffee to water. Eight ounces of generic brewed coffee averages 95 milligrams of caffeine, according to the National Nutrient Database. The range is 102 to 200 milligrams. A 16-ounce cup of coffee -- the “grande” or medium size in most coffee shops -- contains 200 to 300 milligrams of caffeine. A coffee shop’s standard 1-ounce shot of espresso averages 75 milligrams of caffeine, while generic brewed espresso averages 40 milligrams. A 16-ounce vanilla latte contains 150 milligrams of caffeine. Decaffeinated coffee does contain some caffeine. In a study published in the October 2006 issue of the "Journal of Analytical Toxicology," University of Florida researchers found that 16-ounce cups of brewed regular decaffeinated coffee, a medium coffee at most coffee shops, contained anywhere from 3 to 13.9 milligrams of caffeine. 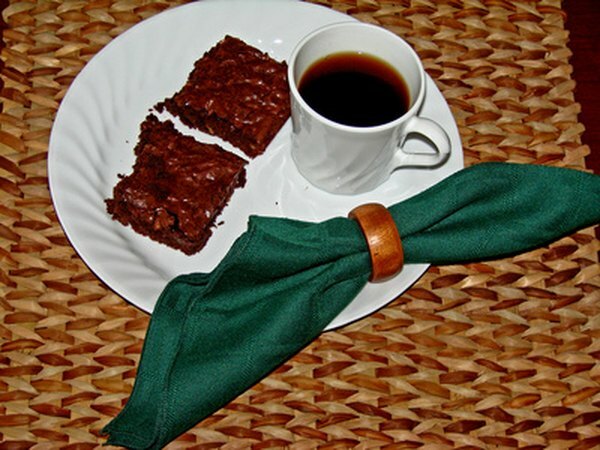 A 1-ounce square of unsweetened baking chocolate contains 23 milligrams of caffeine. A large 3.5-ounce bar of very dark chocolate, which contains 70 percent to 85 percent cocoa, averages 80 milligrams of caffeine. Regular dark chocolate, with 50 percent to 69 percent cocoa, contains around 70 milligrams in a 3.5-ounce bar. The same amount of plain milk chocolate contains 20 milligrams of caffeine. Hot cocoa averages 9 milligrams of caffeine per 8-ounce cup. Caffeine can increase blood pressure, anxiety and heart rate in people who are sensitive to its effects, and it is not recommended for pregnant women because it is linked to miscarriages. If you’re sensitive to caffeine, it’s best to avoid both coffee and chocolate. If you’re especially sensitive to caffeine’s effects, you may need to cut back on or avoid decaf coffee as well.